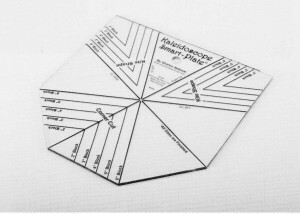 The smart way of making the traditional Kaleidoscope block uses a revolutionary template that allows the basic Pin-wheel to be trimmed to the perfect Kaleidoscope block. 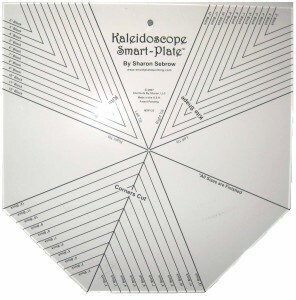 This larger version of the Smart-Plate template has marking to make blocks from 2″ – 12″ finished size. 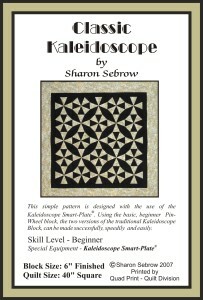 Many patterns for Kaleidoscope blocks as well as other traditional quilt patterns by Sharon Sebrow are available here and at the Cozy Quilt Shoppe. 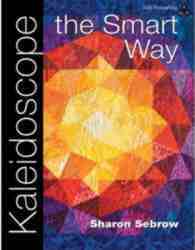 Each full-color and illustrated pattern is designed to teach a short-cut technique and is rated by skill level so you can decide if the pattern is right for you. 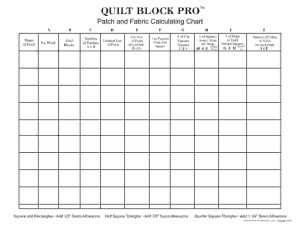 Easily enlarge or reduce blocks, or design your own quilt, complete with fabric amounts and cutting instructions. See how simple it is to calculate fabric amounts and create a cutting plan for your design. Step by step instructions and simple math is all laid out in an easy to fill out table.